What are the dangers of Psychiatric Drugs? Fifty years ago, people understood a drug to be one of two things - a substance legally prescribed by a medical doctor to help treat physical disease, in other words, a medication; or, an illegal substance which characteristically caused addiction, and could lead to a marked change in consciousness, such as the street drugs, heroin and opium. Most people know that illegal drugs are one of society's worst enemies, bringing crime and its associated ills to the streets, communities and schools. Psychiatric drugs have become a panacea for the pressures and stresses of modern living, used extensively in schools, nursing homes, drug rehabilitation centres and prisons. They are relied on to 'help' with everything from weight control, and mathematical and writing problems, to flagging self-confidence, anxiety, sleeping disorders and minor day-to-day upsets. While medical drugs commonly treat, prevent or cure disease or improve health, psychiatric drugs only suppress symptoms - symptoms that return once the drug wears off. Like illicit drugs, they provide no more than a temporary escape from life's problems - click on any of the booklets on the right for more information. Psychiatric drugs are also habit forming and addictive. 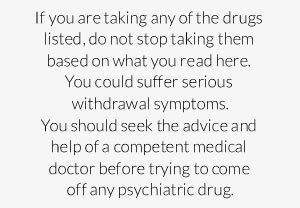 Withdrawal from them can be far more difficult than from illegal drugs. The clearest evidence of the similarities between psychiatric and illegal drugs is the fact that addiction to psychiatric drugs now rivals illegal drug addiction as the No. 1 drug problem in many parts of the world. Such dangerous and problem-ridden drugs have however become widely accepted in society. It is therefore important to be fully informed about the effects of the various categories of drugs that are presented here. If you are taking any of the drugs listed, do not stop taking them based on what you read here. You could suffer serious withdrawal symptoms. You should seek the advice and help of a competent medical doctor before trying to come off any psychiatric drug. 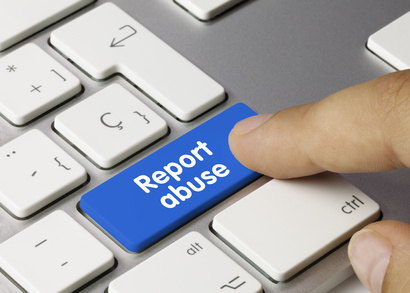 Citizens Commission on Human Rights (CCHR) does not offer medical advice or referrals but provides information as a public service in the interest of informed consent.